After seeing the sorry state our vine was in, I was determined to find a new home for it. In Part 1 of this how-to series, I simply propped it up temporarily with a couple of bamboo sticks. 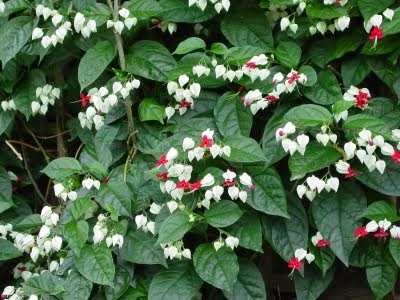 I googled the internet for successful flowering Bleeding Heart Vines and saw a couple of photos that blew me away. This one is quite incredible. It is in a pot but with flowers aplenty! I couldn't imagine the number of flower clusters in this plant. 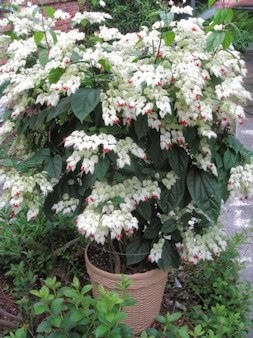 It's as if the color of the white calyxes simply overpower the green leaves. Well, as as they say, "to see is to believe". And after seeing the above, I suppose it IS possible to have such prolific flowering. 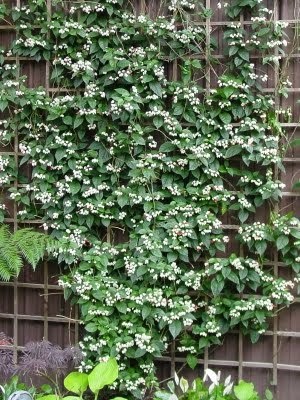 and EVEN if there's no trellis. The wall has a rough finish with just a coat of latex paint over it. There's nothing on it other than the mounted hose rack at the right and a small faucet on the bottom left. We bought that rectangular container for the vine although in the photo above it has some Gotu Kola's. 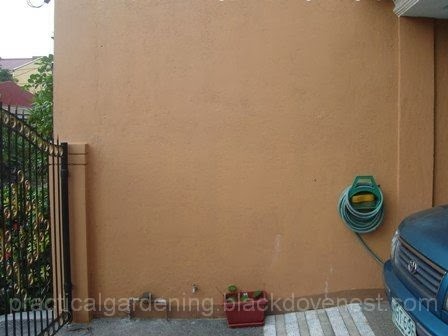 Since the wall is at the side of the garage, the plant needs to be as close as possible to the wall and cannot be too bushy. The good news is I found an internet photo of one vine that I was actually looking for. Here's a closeup of the flower clusters or cymes. Simply awesome isn't it? I was so impressed with the successful growth on the trellis that I had to contact whoever built it. See the continuation in Part 3.